The Spirit of Vengeance is on Agents of SHIELD burning up a body count with hellfire. The new Ghost Rider is Robbie Reyes who drives a flaming 69 Dodge Charger. Besides murdering people by ripping out spines, or burning their very souls into nonexistence, we need to discuss a bigger issue: Reckless driving. Ghost Rider cruises the streets of Los Angeles in search of the guilty to punish. This quest has included driving in excess of the speed limit, even with Daisy Johnson hanging onto the roof of the car. Reckless driving under California law is when someone “drives a vehicle upon a highway in willful or wanton disregard for the safety of persons or property.” Cal. Veh. Code § 23103(a). If someone who is driving recklessly is the proximate cause of bodily injury to another person, they can be imprisoned in county jail for at least 30 days, but not more than six months. Cal. Veh. Code § 23104(a). To prove someone committed reckless driving, the State must prove that the defendant “intentionally did something with knowledge that injury to another was probable or acted with a wanton and reckless disregard for the safety of others and in reckless disregard of the consequences of his acts.” People v. Schumacher, 194 Cal. App. 2d 335, 338-39 (1961). The Ghost Rider drove his Charger with the knowledge that Daisy was on the roof of the car. This would be reckless conduct in disregard for Daisy’s safety. Moreover, Daisy flying off the car, due to the Ghost Rider’s driving, caused Daisy’s injuries. There would be additional charges that could be filed against Robbie, including attempted murder. The law is silent on reckless driving cases with cars that shoot flames. Many juries would think a car shooting flames would be in willful disregard of the safety of people and property if in a residential neighborhood. Moreover, courts have found that excessive speed, along with time of driving, road conditions, and surrounding circumstances, can demonstrate willful conduct. People v. Nowell, 45 Cal. App. 2d Supp. 811, 812 (1941). As such, a flaming speeding car could be proven to be done in the willful disregard of safety of others. 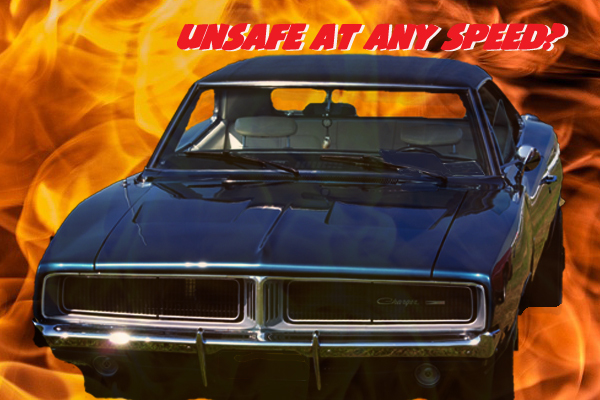 Ghost Rider’s 1969 Charger likely would fail a SMOG inspection for acceptable emissions standards. Cal. Health & Safety Code § 44012(c). The Charger would definitely fail the visible smoke test. Cal. Health & Safety Code § 44012.1 Moreover, most inspections would refuse to inspect the vehicle, because it is unsafe, causing either burns or eternal damnation. Cal. Health & Safety Code § 44012(i). However, the California DMV website states that gasoline powered vehicles from the year model 1975 or older are exempt from SMOG inspections. The DMV website is silent on whether a car older than 1975 powered by hellfire is also exempt. 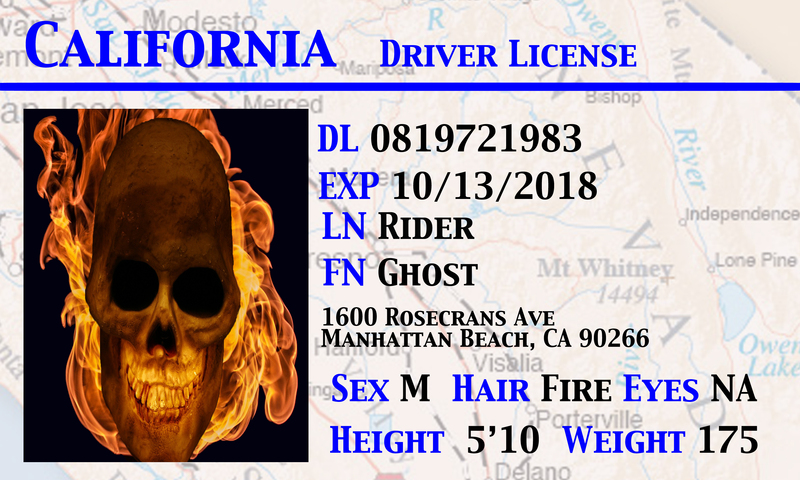 Ghost Rider arguably is driving the Charger without a driver’s license in violation of California law. Cal. Veh. Code § 12500(a). Robbie is arguably not driving the vehicle, because he turns into the Ghost Rider, who is a separate entity. If Robbie is someone in control and not an alter ego, there is a strong argument Robbie’s driver’s license could be suspended for road rage. Cal. Veh. Code § 13351.8. Previous articleDoes Luke Cage Have a Duty to Warn Attackers He’s Unbreakable? Next articleWas Dr. Strange Justified Killing a Possessed Man with Black Magic to Stop a Demon?